Mix the curry, chilli and turmeric powders together with enough water to form a paste. Clean crabs, then remove and crack the pincers and trim the legs. Cut each crab into 4 pieces. 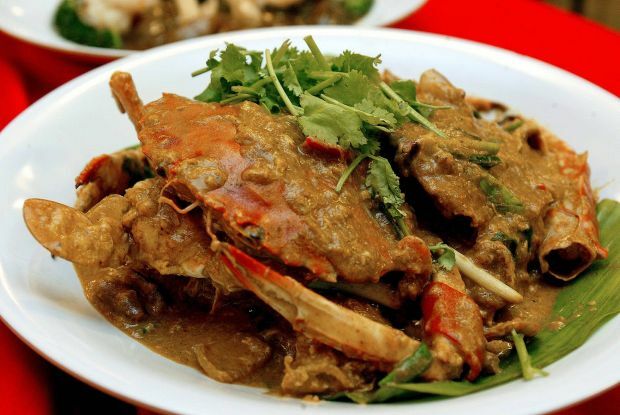 Heat oil in a wok and deep-fry crabs until just cooked through. Dish out and leave aside. Leave 3 tablespoon oil in the wok, fry garlic and dried prawns until fragrant. Add curry paste and curry leaves. Fry until aromatic. Return crabs to the wok and add seasoning. Stir-fry briskly. Add onions and cover the wok. Cook until gravy is reduced and the dish is almost dry. Dish out and serve.